Twisting, turning, discolored and uncomfortable - spider and varicose veins are a painful, and at the very least, uncomfortable condition that an estimated 30% to 60% of adults deal with - according to WebMD. 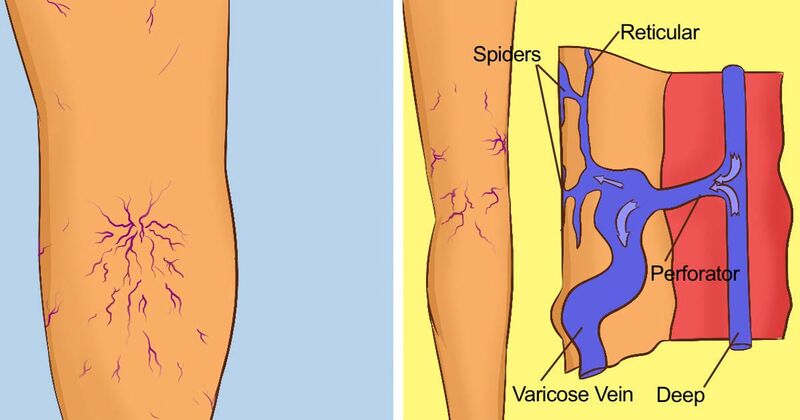 There's many ways you can develop spider and varicose veins, and they usually show up in your legs. Varicose veins are often painful, but not always. You can spot them as twisting and bulging veins deep in the skin that are a dark blue or purple color. You can normally find them in the legs, but spider veins you find in the legs and sometimes the face as well. Spider veins are similar to varicose veins - they can also be painful but they're found much closer to the surface and they're smaller. Spider veins are also usually red or blue rather than deep purple or blue. - Occupations that involve a lot of standing like: hair stylists, nurses, teachers, factory workers etc. - Conditions that cause increased pressure in the abdomen, such as tumors,constipation, and externally worn garments like girdles. All of these symptoms could point to a serious form of vascular disease like blood clot, and if you recognize these symptoms you need to see medical attention right away. Hypertension can put an individual at risk for other serious, life-threatening diseases. Having too little or too much thyroid hormones can result in serious complications.